In a study published in Nature, Northwestern Medicine scientists used a poxvirus to demonstrate that ribosomes can selectively control the process of protein synthesis known as translation. Derek Walsh, PhD, associate professor of Microbiology-Immunology, and his colleagues discovered that this control occurs when poxviruses – the family of viruses responsible for diseases like cowpox and smallpox – convert human ribosomes into a plant-like state in order to replicate. “By converting a subset of our ribosomes, poxvirus provides the first clear evidence of intracellular functional diversification of ribosomes,” Walsh said. 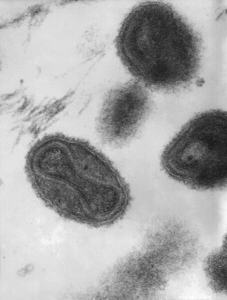 The scientists studied vaccinia virus to demonstrate the mechanism by which the ribosomal protein called RACK1 regulates translation. Vaccinia is closely related to smallpox and is the poxvirus used as the live-virus smallpox vaccine. It has become a widely-studied laboratory prototype for research. Walsh and his team determined that amino acid residues clustered in an extended loop in RACK1 are uniquely modified with a phosphate group. This phosphorylation favors the translation of viral mRNAs with unusual nucleotide sequences termed 5’ polyA-leaders. “Why 5′ polyA-leaders only work in plant but not mammalian cells has been a mystery,” Walsh said. The RACK1 loop region is different in plants and animals: In mammals, the loop is uncharged, but in plants, the loop contains negatively charged amino acids. According to the authors, the pox system identified specific differences in the charge state of a ribosomal protein in plant versus human cells that controls polyA-leader function, illuminating the mechanics of their species-specific leader activity. “Whether poxvirus creates these unusual 5′ polyA-leaders by mistake or benefits from having them has also been a long-standing mystery,” Walsh said. Walsh and his team discovered that the negatively-charged RACK1 loop is exploited to the advantage of the poxvirus, with poxviruses altering host ribosomes to be selective towards viral RNA. “We showed that the virus compensates for a slippery RNA polymerase that mistakenly creates these leaders by very precisely introducing negative charge into a human ribosomal protein to make it resemble the plant form, where these leaders act as natural enhancers. It’s a remarkable case of trans-kingdom mimicry and shows us how exquisitely viruses can manipulate host cell functions, doing some really unexpected things,” Walsh explained. Additional Northwestern study authors include Jeffrey Savas, PhD, assistant professor of Neurology in the Division of Movement Disorders, and of Medicine and Pharmacology, as well as Sujata Jha, PhD, Madeline Rollins, Dean Procter, PhD, Elizabeth Hall and Kira Cozzolino. The research was funded in part by National Institutes of Health grants R01AI127456, R21AI105330, R00DC013805 and R01AI099506; Chicago Biomedical Consortium Catalyst Award C-068; and training grant T32GM008061.